When the American Cancer Society announced new guidelines for mammograms a week ago, the response on the organization’s Facebook page was swift. Indeed. Women who pay attention to their own health may be feeling a sense of whiplash from recent pronouncements. Since 2003, the American Cancer Society has suggested women of average risk of getting breast cancer get mammograms every year once they turn 40, as well as regular breast exams by their doctors. This was among some of the most aggressive guidelines of all the entities who issue screening guidelines. Last week, the 102-year old organization published new guidelines in JAMA: The Journal of the American Medical Association that suggested annual mammograms start for women at age 45, continue once a year until age 54, and then be reduced to every other year. Both young and old women were angry to find that they now fall outside the guidelines for screening. 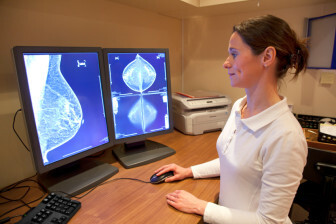 American Cancer Society now suggests that annual mammograms start at age 45 for women. Both guidelines were issued, said the society and the task force — after rigorous review of data, though how much data exists for outcomes for significantly older woman is another question entirely. So how can two entities consulting the same science have such different ideas of what constitutes good preventive care for women? • Roughly 231,840 women will be diagnosed with invasive breast cancer. • Another 60,290 women will be diagnosed with cases of carcinoma in situ—non-invasive cancer. • Roughly 40,290 women will die from breast cancer. Such rotating pronouncements can ruin—or end—lives, says Jacobs. Since entering practice in 1977, Jacobs has treated plenty of women who fall outside the most recent target ages for regular screenings, including a 17-year-old woman with advanced breast cancer. He lost an aunt who developed breast cancer in her 80s—also past the time of most recommendations for screening. Women who pay attention to these latest guidelines may be putting themselves at risk, and for what? “Are you going to write these women off?” asks Jacobs. Susan Campbell is a distinguished lecturer at the University of New Haven and the Robert C. Vance Chair for Journalism and Mass Communication at Central Connecticut State University. She can be reached at slcampbell417@gmail.com.